Coming into Tuesday’s league doubleheader against Davenport, the Cougars have the ability to win the league championship outright with a sweep of the Gorillas. Chewelah’s baseball team is red hot right now, winning seven straight games with gem-worthy pitching and bats that can score a lot of runs when needed. As a team, the Cougars are hitting .297 with Lukas Kubik’s .423 average leading the way. While it’s only April 15, a shortened schedule, a change to the 2B ranks where teams play just one doubleheader against each other, the dropping of the Wilbur-Creston baseball team this year and Chewelah’s overall impressive start has put them in the driver’s seat pretty early in the year. “Coming into this year I wasn’t entirely sure what to expect, I knew that Asotin and Colfax are always good but as far as everyone else I had no idea what to expect,” Cougar coach Sawyer Bardwell said. The season began with cancellation after cancellation. 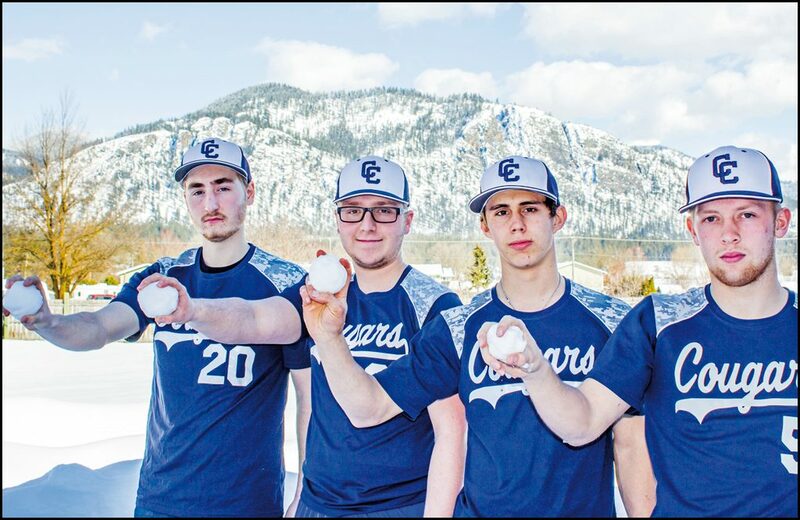 Due to late snow, Chewelah didn’t even play their first game until March 23 and that was the first time they saw a baseball diamond, having had to practice in the JJSHS, JMS gym and The Body Shop in the early spring. “This season has been tough with getting time on the field and with weather changing so fast we have had to change a move games which has been hard on everyone but our players have rallied to the occasion and played well regardless,” Bardwell said. While they dropped their opening doubleheader against Deer Park, and was nipped by St. George’s 8-6 in the front end of a doubleheader, the Cougars have been on fire since. Since March 29, Chewelah has not allowed more than five runs in a game and recorded a shutout against a very talented NWC team in league play. Justin Rollis and Andrew Sweat have been the rocks in the rotation, with Sweat striking out 10 in a 2-0 victory over the Crusaders on April 12. Sweat has a 1.50 ERA on the year and 28 strikeouts in just four starts. Rollis has gobbled up innings and put in gem after gem as well. Rollis has a 2.71 ERA with 28 strikeouts as well. “Our pitching has been our strength and our bats are getting hotter as the season has continued. We still haven’t played our best baseball yet, but we will get there. We are improving every game and everyday,” Bardwell said. The most productive Chewelah batter has been Zak Kubik, who it batting .300, with nine RBI and three doubles. Catcher Carl Oman is averaging .406 at the plate with five doubles and eight RBI. In all, the Cougars have six batters hitting .300 or better on the year. The league title-clinching doubleheader against Davenport will begin at 2 p.m. on Tuesday down south. The nightcap of the doubleheader will be played at 4 p.m.